Ever since I entered Secondary School in 1960, my day invariably begins by spending atleast 30 minutes going through The Times of India. A rewarding habit that has stayed with me till date. While appreciating your greeting the Maharashtrian readers on ‘Gudi Padwa’ and your readers in Karnataka and Andhra Pradesh on ‘Ugadi’ and in Kashmir on 'Navreh' you did not miss out on the miniscule Parsi community on ‘Navroze’. Then how is it that you missed out the enterprising Sindhi community that celebrates ‘Chetichand’, its new year, on the same day? As is the case with most communities, the youth today in their anxiety to become a part of the 'Global Village' tend to ignore their own identity - culture, heritage and language. And, in our case, on account of the absence of a state of our own, the problem is even more acute. Not only is there a lack of awareness but also the lack of desire to become aware and an aversion to being identified as Sindhis. 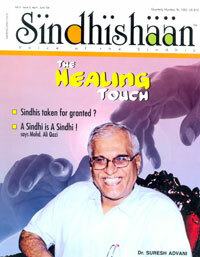 It was for this very reason that I began publishing the quarterly magazine "Sindhishaan" (latest copy enclosed), since 2001, in English and targeted the second post-partition generation to generate interest in their roots and take pride in their heritage. So my humble request - next year do not forget the Sindhis. When the youth of the community realize that "The Times of India" recognizes them and remembers them - they will start feeling proud to be Sindhis and not be ashamed in revealing that they are Sindhis -whose parents were refugees but are now the citizens of the great nation — India. Please find attached herewith copy of my communication to you last year. At the cost of being a pain in the ………. I am compelled to communicate the hurt and pain at your having ignored my community's - the Sindhi community's New Year 'Chetichand' in your publication yesterday, inspite of my reminder dated 29th instant. Off course I cannot and do not demand any explanation for this omission but I think I'm justified in seeking a response as a courtesy to your readers and deserve an answer for your determination of not wanting to recognize the presence of my community. Do you have something against the Sindhis? A line in clarifying your stand will be highly appreciated.